MANILA — A new book on the South China Sea will be launched at the De La Salle University (DLSU) in Manila this week. The book, entitled “The South China Sea Arbitration: Understanding the Awards and Debating with China,” is written by Dr. Alfredo C. Robles Jr. and jointly published by DLSU Publishing House and Sussex Academic Press in United Kingdom. It will be launched on January 22, which is also the same day in 2013 when the Philippines formally transmitted to China a notification and statement of claim. Among the information revealed by Robles’ book is that China has used disinformation and propaganda to undermine the Philippines’ win in the South China Sea arbitration. In his book, Robles detailed how China attempted to influence the Tribunal without the knowledge of the Philippines, as well as dismissed the arbitration as non-binding, among other things. “These claims were outrageous, but they could only be refuted using a scholarly approach,” Robles said. Robles is a university fellow at DLSU Manila. He holds doctorate degrees in International and European Studies from Universite Paris I Pantheon Sorbonne and in Political Science from Syracuse University. In a rare public engagement, Former President Benigno Aquino III will answer burning questions on the arbitration case that the Philippines won against China in 2016. Aquino is the guest of honor at the launch of Alfredo Robles Jr.’s book called “The South China Sea Arbitration: Understanding the Awards and Debating with China” to be held on Tuesday (January 22) at the De La Salle University. It was under Aquino’s administration that the Philippines questioned China’s nine-dash line claim over the South China Sea, which included the West Philippine Sea, before the Permanent Court of Arbitration in The Netherlands. The Philippine argued that China’s sweeping claim over the South China Sea goes against the United Nations Convention on the Law of the Sea. The PCA ruled in the Philippines’ favor on July 12, 2016, shortly after Aquino’s term ended. Over the past month, some international news outlets have reported that Vietnam is pursuing a strong stance on the South China Sea. Yet a closer look at Hanoi’s overall position – as well as those of other countries and international entities – vis-à-vis the maritime issue shows that is not the case. On December 30, Reuters reported that Vietnam was pushing for tough provisions in the code of conduct (COC) in the South China Sea that Southeast Asian nations and China are negotiating. More precisely, according to this report, Vietnam wants the pact to outlaw Beijing’s controversial actions in the disputed area in recent years, including the building of artificial islands and military activities such as missile deployments. It also pushes for a ban on any new Air Defense Identification Zone (ADIZ) that China unilaterally announced over the East China Sea in 2013. It equally demands that disputing states clarify their maritime claims as per international law. Last Friday, the Hong Kong-based newspaper ran an article headlined“Vietnam risks Beijing’s ire as it uses US freedom-of-navigation exercise to stake its claim in South China Sea.” That article referred to a freedom-of-navigation operation (FONOP) by USS McCampbell near the Paracel Islands on January 7 and remarks by a Vietnamese Foreign Ministry spokeswoman about it two days later. She also stressed that as a member of the 1982 UN Convention on the Law of the Sea (UNCLOS) and a coastal state in the East Sea (Vietnamese name for the South China Sea), her country always respects the right to freedom of navigation and aviation in the area of other states in line with international law, especially the UNCLOS. It could be that, as the SCMP’s article said, Beijing, which was angry about the USS McCampbell’s FONOP, was not pleased with the Vietnamese spokeswoman’s remarks and that Hanoi used the US military’s move to reaffirm its territorial claims in the area. But Vietnam’s demands that states clarify their maritime claims, resolve their disputes and operate in the area in line with international law, notably UNCLOS, are not new. In its own statements, joint declarations with its main partners – such as the United States, India, Japan, Australia, South Korea, Indonesia, Singapore, the United Kingdom and France – as well as talks with China, Vietnam has long and consistently maintained an international-law-based approach to the South China Sea issue. Of Vietnam’s demands reported by Reuters, the stress that disputing states “clarify their maritime claims in according to international law” is, without doubt, the most fundamental one. All nations, strong and weak alike, should, if not must, make their claims, resolve their disputes and act in accordance with international law. In this sense, Vietnam’s South China Sea posture is not tough at all. On the contrary, it’s very sensible, advisable and, as such, widely supported. Yet for China, the provisions that its communist neighbor wants the COC to include – notably that “states clarify their maritime claims” in the 3.5-million-square-kilometer sea “according to international law” – are tough. As the December 31 SCMP article said, they are “likely to prove unpalatable to Beijing.” This is because such propositions would invalidate the Asian giant’s controversial, if not illegal, claims and actions in the resources-rich and strategically vital waters. As ruled by a UNCLOS tribunal in 2016, if it is based on international law, notably the 1982 Convention, China’s “nine-dash-line” claim would be unlawful. And as that infamous line was already declared illegal by the international tribunal, many, if not most, of China’s contentious actions within it, including its recent land reclamation and military buildup or a future ADIZ declaration, are illegal. That said, it may be true that Vietnam is adopting a tougher posture than it was, and that would be understandable. A few years ago, the Philippines and Vietnam were the two regional countries that were mostly critical of China’s behavior in the area. But since Rodrigo Duterte became the Philippines’ president in 2016, Manila has pursued an accommodating, if not defeatist, attitude toward Beijing. The maverick leader is now seen as “China’s voice in ASEAN.” It’s no coincidence that China, which was previously very reluctant to negotiate the COC, has recently vowed to conclude it before 2021. Both the Duterte presidency and the Philippines’ term as the coordinator of the ASEAN-China dialogue end in that year. Against this backdrop, Hanoi needs to voice its position robustly if it wants to “remain resolute and persistent in the defense of [Vietnam’s] national independence, sovereignty and territorial unity and integrity.” An effective – if not, the most plausible – way to achieve that goal is to internationalize the issue and call for an international-law-based approach to it, because international law and many other countries are on its side. By calling claimant parties as well as other interested countries to act according to international law in the South China Sea, Hanoi is, intentionally or not, urging China to practice what Xi Jinping, its core leader, repeatedly and, indeed, beautifully, preaches on the world stage. Should Beijing apply all this to the South China Sea, the intractable maritime disputes would be easily and peacefully resolved. In the South China Sea disputes, Vietnam dares to do what the Philippines didn’t: challenge China’s mission to turn the vast waterway into its own sea. That’s according to a recent Reuters report, which claims that Vietnam is pushing for a pact that will outlaw many of China’s ongoing activities in the South China Sea. Like the building of artificial islands, blockades and offensive weaponry such as missile deployments; and the Air Defence Identification Zone—a conduct code China initiated back in 2013. This isn’t the first time Hanoi is challenging China’s claims in the South China Sea. Back in July of 2017, Vietnam granted Indian oil firm ONGC Videsh a two-year extension to explore oil block 128, according to another Reuters report. And that’s something Beijing loudly opposed. In recent years, China has considered the South China Sea its own. All of it, including the artificial islands Beijing has been building in disputed waters, and the economic resources that are hidden below the vast sea area. And it is determined to use its old and new naval powers to make sure that no other country reaches for these resources without its permission. Philippines President Rodrigo Duterte understands Beijing’s determination very well. Back in April of 2018 he reversed his earlier decision to raise the Philippine flag in disputed islands, following Beijing’s “friendly” advice. A year before that incident, the Philippines and its close ally, the U.S., won an international arbitration ruling that China has no historic title over the waters of the South China Sea. Yet Duterte didn’t dare enforce it. Instead, he sided with Beijing on the dispute, and sought a “divorce” from the U.S.
Duterte’s flip-flops saved peace in the South China Sea by changing the rules of the game for China and the US, at least according to his own wisdom. That doesn’t seem to be the case with Vietnam– which also claims parts of the waterway. And it has a strong ally on its side: the US, which has been trying to enforce the freedom of navigation in the South China Sea, and save peace, too! So far, financial markets in the region do not seem that concerned, at least for now. Instead, they have been focusing on the economic fundamentals rather than the geopolitics of the region; and on the rising interest rates in the US. But things may change in the future, as an escalation of South China Sea disputes could add to investor anxieties fueled by the US-China trade war. The Trump administration’s free and open Indo-Pacific (FOIP) strategy is quickly gaining more definition. The Arleigh Burke-class guided-missile destroyer USS Decatur (DDG 73) fires two Standard Missile (SM) 2 missile during a live-fire evolution. As Washington starts to counter Beijing on multiple fronts — economically, politically and militarily — the Trump administration’s free and open Indo-Pacific (FOIP) strategy is quickly gaining more definition. The United States has struggled to define its FOIP, a regional construct also led by Australia, India, and Japan, ever since Trump signed on to the concept last November at the Asia-Pacific Economic Cooperation (APEC) CEO Summit held in Da Nang. In recent days, however, U.S. officials, including Vice President Mike Pence, have started to comment publiclyon details of the strategy. Another U.S. official, U.S. Assistant Secretary of Defense for Asian and Pacific Security Affairs Randall G. Schriver, recently visited Vietnam to speak on what the U.S. FOIP means for Hanoi. Schriver was making his third visit to Vietnam as part of the annual Defense Policy Dialogue between the United States and Vietnam’s Ministry of National Defense, amid growing military ties between the two former combatants. In his speech at the American Center in Ho Chi Minh City on October 5, Schriver began by referring to the Indo-Pacific region as a “priority theater,” while highlighting some of the more aggressive actions undertaken by China in the region, particularly in the South China Sea (which Vietnam refers to as the East Sea). Schriver defined the new U.S. National Defense Strategy as based upon three pillars: 1) recognition of great power competition, primarily between China, Russia, and the United States; 2) the development and nurturing of defense allies and partners; and 3) structural reforms of the U.S. Defense Department to better undertake its mission. One of the ways in which Vietnam can gain from the FOIP strategy is through freedom of navigation operations (FONOPs) conducted by major players in the region. These FONOPs are intended to show Beijing and the other littoral nations of the South China Sea that passage by naval vessels can be free and open — despite Beijing’s claim to some 90 percent of the waters and its determination to control rights to passage. Schriver spoke at some length concerning one such recent U.S. FONOP involving the near collision between the USS Decatur, an Arleigh Burke-class destroyer, and the Lanzhou, a Luyang-II class guided-missile destroyer, near the Gaven Reef in the disputed Spratly Islands (also claimed by Vietnam). During the FONOP, the Chinese destroyer reportedly passed within some 45 yards (40 meters) of the U.S. destroyer, causing the U.S. warship to alter its course in order to avoid a collision. This year, the U.S. has conducted four FONOPs in the South China Sea so far, compared to four in 2017, three in 2016, and one in 2015. According to Schriver, the U.S. FONOPs are in response to the construction of artificial islands by Beijing — built around reefs and rocks to create “facts on the ground” in an effort to further China’s claims. Some of those rocks and reefs claimed by China (such as Gaven Reef) used to be submerged during high tide. Schriver suggested further action may be taken by the Trump administration against Chinese companies involved in the construction of these artificial islands — presumably through the implementation of economic sanctions. In the airspace over the disputed waters, Schriver mentioned the FOIP policy would also resist any existing or new declarations by Beijing of Air Defense Identification Zones (ADIZ), one of the ways in which China attempts to assert its sovereignty in the region. Schriver stated that under a free and open Indo-Pacific “the United States will fly, sail, and operate wherever international law allows,” consistent with the previous policy of former Secretary of Defense Ash Carter under the Obama administration “pivot to Asia,” and revealing implicit support for the territorial claims of littoral states such as Vietnam. While the new U.S. National Defense Strategy calls for the development and nurturing of defense partners such as Vietnam, Hanoi will not get too friendly thanks to its foreign policy of “Three Nos”: no foreign bases on its territory, no military alliances, and no involving third parties in its disputes. While Hanoi does not officially involve third parties in its dispute over the South China Sea, Vietnam will stand to gain from an increase in FONOPs and other challenges to Beijing’s assertion of authority under the U.S. administration’s free and open Indo-Pacific strategy. Some of the naval vessels conducting FONOPs will continue to make port call visits at Cam Ranh Bay, furthering the development and nurturing of defense partnerships between Hanoi, the United States, and other major naval players in the region, while their FONOPs will show implicit support for the claims of Vietnam and other littoral nations. Finally, with the potential for greater cooperation among the great naval powers in the region to promote and administer a free and open Indo-Pacific strategy, in an era of greater economic, military, and political competition among China, Russia, and the United States, Hanoi may find it easier than ever to skillfully play all three partners off against each other to maximum advantage. Gary Sands is a Senior Analyst at Wikistrat, a crowdsourced consultancy, and a Director at Highway West Capital Advisors, a venture capital, project finance and political risk advisory. A former diplomat with the U.S. Overseas Private Investment Corporation, he has contributed a number of op-eds for Forbes, U.S. News and World Report, Newsweek, Washington Times, The Diplomat, Asia Times, National Interest, EurasiaNet, and the South China Morning Post. He is currently based in Taipei. Vietnam’s government stated its concerns to Ukraine over plastic globes being sold in the country that showed the Vietnamese province of Quang Ninh as Chinese territory. The state-run Tuoi Tre newspaper quoted the Ukrainian company that sold the globes as saying they were purchased from Chinese traders in Kharkov, Ukraine’s second-largest city. It said Vietnam’s embassy in Ukraine had sent letters to the Ukrainian foreign ministry and the company involved and that sales had been discontinued. The issue was reported in a briefing paper produced by a consultancy run by Carlyle Thayer, an expert on Southeast Asia and emeritus professor at Australia’s University of New South Wales. Quang Ninh borders China and is home to the famed Ha Long Bay scenic area. China’s military seized islands claimed by Vietnam in the Paracels group in a bloody 1974 battle and the two continue to feud over the chain and other South China Sea territories. In May, Vietnamese anger was sparked by a group of Chinese tourists who arrived in the country wearing T-shirts featuring the so-called “nine-dash line” demarcating Beijing South China Sea claims, many of which overlap with Vietnam’s own. Taiwan’s coast guard said annual live-fire exercises conducted at Taiping island in the Spratly island group were routine and didn’t endanger shipping. Neighboring countries were informed in advance of the exercises carried out on last week, the coast guard said. Taiping island, also known internationally as Itu Aba, is Taiwan’s sole possession in the highly contested Spratly chain. It is the largest naturally occurring islet in the group but has been dwarfed by China’s construction in the area of seven man-made islands atop coral reefs equipped with airstrips and other military infrastructure. China, the Philippines and Vietnam also claim Taiping, and Vietnamese foreign ministry spokeswoman Nguyen Phuong Tra last week had said her country “resolutely opposed” the drill. Tra said the exercises violated Vietnam’s sovereignty and posed a threat to navigation and aviation security in the region, Vietnam’s official news agency reported. Taiwan’s formal claim to virtually the entire South China Sea mirrors that of China’s, but it has limited its activities to Taiping and the Pratas group to the north. The Philippines says it is concerned about possible Chinese nuclear deployments in the South China Sea following the issuing of a Pentagon report warning Beijing could use nuclear energy to provide power to man-made islands. Roque also cited an Association of Southeast Asian Nations treaty designating the entire region a nuclear-free zone. “We are concerned about the possibility that any foreign power, be it American, Russian, Chinese may bring nuclear warheads into our territory and into ASEAN,” Roque said. In its 2018 annual report to Congress on military and security developments involving China, the Pentagon said China’s plans to use floating nuclear power plants to power its islands “may add a nuclear element to the territorial dispute. The report said nothing about the possibility of China deploying nuclear weapons in the South China Sea. Malaysia has suspended a multibillion-dollar raft of construction projects financed by Chinese loans, possibly stymieing Beijing’s drive to strengthen its hold over Southeast Asia’s economy. China has sought to downplay the move announced by Prime Minister Mahathir Mohamad on the final day of a visit to Beijing on Aug. 20, but it is still seen as a blow to Chinese President Xi Jinping’s signature “Belt and Road” initiative. Mahathir said he was seeking support from China’s leaders over Malaysia’s situation as it deals with a mass of debt and other economic problems created under previous administrations. Mahathir is a vocal critic of large-scale investment in his country backed by loans from Beijing and has tested Malaysia’s ties with China by suspending Chinese-financed infrastructure projects. The suspended projects comprise a Chinese-backed $20 billion East Coast Rail Link and two energy pipelines worth $2.3 billion. Malaysia has claims to territory in the South China Sea that overlap with those of China, but under Mahathir’s predecessors, took a low-key approach to asserting those in deference to strongly positive ties with Beijing. Mahathir is seen as possibly taking a firmer approach. Associated Press writer Tran Van Minh contributed to this report from Hanoi, Vietnam. Niña P. Calleja | Inquirer Global Nation – HO CHI MINH CITY — The United States seems to be taking a stronger stance against China’s activities in the South China Sea, according to Dr. Ha Anh Tuan, director of the Institute for Foreign Policy and Strategic Studies (IFPSS) of the Diplomatic Academy of Vietnam. Among the indications this, Ha pointed out, are the recently implemented Freedom of Investigation Operation (Fonop) implemented by the United States and the meeting between US President Donald Trump and Vietnamese Prime Minister Nguyen Xuan Phuc on May 31. On May 25, the USS Dewey, a guided missile destroyer of the US Navy, sailed within 12 nautical miles (22.22 kilometers) of Mischief Reef (Panganiban Reef) in the Spratly Islands, where China has built one of its man-made islands. The reef is being claimed by the Philippines, Vietnam, and China. Fonop is meant to counter China’s assertion of de facto control over the South China China, where it has nearly finished building artificial islands and military bases. Ha said the delivery of the six coastal patrol vessels to Vietnam, followed by the meeting between Trump and Nguyen on May 31, showed a stronger support of the US against China’s occupation in the South China Sea. “All are signs of a US commitment, which Vietnam had feared was waning under President Donald Trump,” he said. Nguyen went to the US for a three-day official visit from May 29 to May 31, which culminated in his first meeting with Trump at the White House. He is the first head of state in Southeast Asia to meet Trump since the latter’s inauguration this year. Visiting to the US on Trump’s official invitation, the Vietnamese leader also hoped to boost relationship with the US, Vietnam’s top trading partner despite its withdrawal from the Trans-Pacific Partnership (TPP) deal, the trade treaty which an export-oriented Vietnam would have likely benefited from. Since diplomatic ties between Vietnam and US normalized 20 years ago, bilateral trade has flourished – reaching $36.3 billion in 2014 and $45 billion in 2016. China, meanwhile, condemned the US operation, saying the US ship did not ask permission to enter what it claimed to be its territorial waters. But other claimants in the South China Sea, like Vietnam, were hoping to see more of the US presence in the region “as a way to maintain regional peace, stability and security,” Ha said. Vietnam and the Philippines, along Malaysia and Brunei, have competing claims with China over the South China Sea. After his US trip, the Vietnamese prime minister would go next to Japan for an official visit from June 4 to 8 at the invitation of Japanese Prime Minister Shinzo Abe. A meeting between President Rodrigo Duterte and Trump is also in the offing, as the US president had invited the Philippine leader to visit the White House. Trump is also expected to visit Vietnam in November for the Asia Pacific Economic Cooperation summit to be held there in Danang. by Rajan Menon | The Nation (New York/US) The brewing conflict in the South China Sea could become the next Cuban missile crisis. That became all-too-apparent during Tillerson’s January 11 confirmation hearing before the Senate Foreign Relations Committee. He was asked for his view on the military infrastructure China has been creating on various islands in the South China Sea, the ownership of which other Asian countries, including Taiwan, the Philippines, Vietnam, Malaysia, and Brunei claim as well. China’s actions, he replied, were “extremely worrisome,” likening them to Russia’s annexation of Ukraine’s Crimean peninsula, an infraction for which Russia was slapped with economic sanctions. All right, so maybe a novice had a bad day. Maybe the secretary-of-state-to-be simply ad-libbed and misspoke… whatever. If so, you might have expected a later clarification from him or from someone on the Trump national-security team anyway. Candidate Trump also let it be known that he wouldn’t allow Beijing to get away with such cheekiness on his watch. Why had the Chinese engaged in military construction on the islands? Trump had a simple answer (as he invariably does): China “has no respect for our president and no respect for our country.” The implication was evident. Things would be different once he settled into the White House and made America great again. Then—it was easy enough to conclude—China had better watch out. Standard campaign bombast? Well, Trump hasn’t changed his tune a bit since being elected. On December 4, using (of course!) his Twitter account, he blasted Beijing for having built “a massive military complex in the middle of the South China Sea.” And it’s safe to assume that he signed off on Spicer’s combative comments as well. In short, his administration has already drawn a red line—but in the way a petulant child might with a crayon. During and after the campaign he made much of his determination to regain the respect he claims the United States has lost in the world, notably from adversaries like China. The danger here is that, in dealing with that country, Trump could, as is typical, make it all about himself, all about “winning,” one of his most beloved words, and disaster might follow. As Marina Tsirbas, a former diplomat now at the Australian National University’s National Security College, explains, Beijing’s written and verbal statements on the South China Sea lend themselves to two different interpretations. The Chinese government’s position boils down to something like this: “We own everything—the waters, islands and reefs, marine resources, and energy and mineral deposits—within the Nine-Dash Line.” That demarcation line, which incidentally has had 10 dashes, and sometimes 11, originally appeared in 1947 maps of the Republic of China, the Nationalist government that would soon flee to the island of Taiwan leaving the Chinese Communists in charge of the mainland. When Mao Ze Dong and his associates established the People’s Republic, they retained that Nationalist map and the demarcation line that went with it, which just happened to enclose virtually all of the South China Sea, claiming sovereign rights. This stance—think of it as Beijing’s hard line on the subject—raises instant questions about other countries’ navigation and overflight rights through that much-used region. In essence, do they have any and, if so, will Beijing alone be the one to define what those are? And will those definitions start to change as China becomes ever more powerful? These are hardly trivial concerns, given that about $5 trillion worth of goods pass through the South China Sea annually. Then there’s what might be called Beijing’s softer line, based on rights accorded by the legal concepts of the territorial sea and the Exclusive Economic Zone (EEZ). Under the UN Convention on the Law of the Sea (UNCLOS), which took effect in 1994 and has been signed by 167 states (including China but not the United States), a country has sovereign control within 12 nautical miles of its coast as well as of land formations in that perimeter visible at high tide. But other countries have the right of “innocent passage.” The EEZ goes further. It provides a rightful claimant control over access to fishing, as well as seabed and subsoil natural resources, within “an area beyond and adjacent to the territorial sea” extending 200 nautical miles, while ensuring other states’ freedom of passage by air and sea. UNCLOS also gives a state with an EEZ control over “the establishment and use of artificial islands, installations, and structures” within that zone—an important provision at our present moment. What makes all of this so much more complicated is that many of the islands and reefs in the South China Sea that provide the basis for defining China’s EEZ are also claimed by other countries under the terms of UNCLOS. 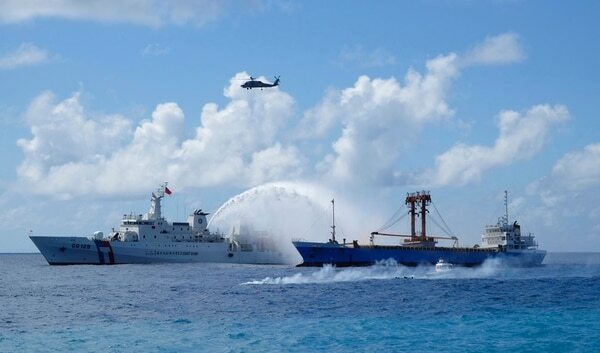 That, of course, immediately raises questions about the legality of Beijing’s military construction projects in that watery expanse on islands, atolls, and strips of land it’s dredging into existence, as well as its claims to seabed energy resources, fishing rights, and land reclamation rights there—to say nothing about its willingness to seize some of them by force, rival claims be damned. Moreover, figuring out which of these two positions—hard or soft—China embraces at any moment is tricky indeed. Beijing, for instance, insists that it upholds freedom of navigation and overflight rights in the Sea, but it has also said that these rights don’t apply to warships and military aircraft. In recent years its warplanes have intercepted, and at close quarters, American military aircraft flying outside Chinese territorial waters in the same region. Similarly, in 2015, Chinese aircraft and ships followed and issued warnings to an American warship off Subi Reef in the Spratly Islands, which both China and Vietnam claim in their entirety. This past December, its Navy seized, but later returned, an underwater drone the American naval ship Bowditch had been operating near the coast of the Philippines. True, as the acolytes of a “unipolar” world remind us, China’s military spending amounts to barely more than a quarter of Washington’s and US naval and air forces are far more advanced and lethal than their Chinese equivalents. However, although there certainly is a debate about the legal validity and historical accuracy of China’s territorial claims, given the increasingly acrimonious relationship between Washington and Beijing the more strategically salient point may be that these territories, thousands of miles from the US mainland, mean so much more to China than they do to the United States. By now, they are inextricably bound up with its national identity and pride, and with powerful historical and nationalistic memories—with, that is, a sense that, after nearly two centuries of humiliation at the hands of the West, China is now a rising global power that can no longer be pushed around. Certainly, the Party understands the danger that runaway nationalism could pose to its authority. Its paper, the People’s Daily, condemned the “irrational patriotism” that manifested itself in social media forums and street protests after the recent international tribunal’s verdict favoring the Philippines. And that’s hardly the first time a foreign-policy fracas has excited public passions. Think, for example, of the anti-Japanese demonstrations that swept the country in 2005, provoked by Japanese school textbooks that sanitized that country’s World War II–era atrocities in China. Those protests spread to many cities, and the numbers were sizeable with more than 10,000 angry demonstrators on the streets of Shanghai alone. At first, the leadership encouraged the rallies, but it got nervous as things started to spin out of control. In the event of a military crisis between China and the United States, neither side may want an escalation, to say nothing of a nuclear war. Yet Trump’s threats to impose 45 percent tariffs on Chinese exports to the United States and his repeated condemnation of China as a “currency manipulator” and stealer of American jobs have already produced a poisonous atmosphere between the world’s two most powerful countries. And it was made worse by his December phone conversation with Taiwan’s president, Tsai Ing-wen, which created doubts about his commitment to the One China policy the United States has adhered to since 1972. The Chinese authorities apparently made it clear to the White House that there couldn’t even be a first-time phone call to Xi unless the new president agreed to stick with that policy. During a conversation with the Chinese president on February 9, Trump reportedly provided that essential assurance. Given the new American president’s volatility, however, Beijing will be playing close attention to his words and actions, even his symbolic ones, related to Taiwan. Sooner or later, if Trump doesn’t also dial down the rest of his rhetoric on China, its leaders will surely ratchet up theirs, thereby aggravating the situation further. So far, they’ve restrained themselves in order to figure Trump out—not an easy task even for Americans—and in hopes that his present way of dealing with the world might be replaced with something more conventional and recognizable. Hope, as they say, springs eternal, but as of now, in repeatedly insisting that China must do as he says, Trump and his surrogates have inserted themselves and the country into a complicated territorial dispute far from America’s shores. Washington’s hubris in acting as the keeper of world order but regularly breaking the rules as it wishes, whether by invading Iraq in 2003 or making open use of torture and a global network of secret prisons, is an aspect of American behavior long obvious to foreign powers. It looks to be the essence of Trumpism, too, even if its roots are old indeed. Don’t dismiss the importance of heated exchanges between Washington and Beijing in the wake of Trump’s election. The political atmosphere between rival powers, especially those with massive arsenals, can matter a great deal when they face off in a crisis. Pernicious stereotypes and mutual mistrust only increase the odds that crucial information will be misinterpreted in the heat of the moment because of entrenched beliefs that are immune to contrary evidence, misperceptions, worst-case calculations, and up-the-ante reactions. In academic jargon, these constitute the ingredients for a classic conflict spiral. In such a situation, events take control of leaders, producing outcomes that none of them sought. Not for nothing during the Cuban missile crisis of 1962 did President John Kennedy look to Barbara Tuchman’s book, Guns of August—a gripping account of how Europe slipped and slid into a disastrous world war in 1914. There has been lots of anxiety about the malign effects that Donald Trump’s temperament and beliefs could have domestically, and for good reason. But in domestic politics, institutions and laws, civic organizations, the press, and public protests can serve, however imperfectly, as countervailing forces. In international politics, crises can erupt suddenly and unfold rapidly—and the checks on rash behavior by American presidents are much weaker. They have considerable leeway to use military force (having repeatedly circumvented the War Powers Act). They can manipulate public opinion from the bully pulpit and shape the flow of information. (Think back to the Iraq war.) Congress typically rallies reflexively around the flag during international crises. In such moments, citizens’ criticism or mass protest invites charges of disloyalty. This is why the brewing conflict in the South China Sea and rising animosities on both sides could produce something resembling a Cuban missile crisis–style situation—with the United States lacking the geographical advantage this time around. If you think that a war between China and the United States couldn’t possibly happen, you might have a point in ordinary times, which these distinctly aren’t. by Panos Mourdoukoutas | Forbes (New York/US) Investors seem to be spending too much time these days analyzing the Fed’s next interest rate move and Washington’s next fiscal and deregulation measures, and not enough time watching the gathering of geopolitical storms that may take a toll on their global investment holdings. One of those storms is gathering over the South China Sea, and it’s threatening to disrupt one of the world’s largest trade routes with devastating consequences — for the economies of the region and the multinational companies that draw a big chunk of their revenues from there. The South China Sea disputes began as a regional tug of war between China and its neighbors, but they quickly turned into a showdown of economic and military might between China and the US. Almost three years ago, China elevated the tensions in the region by building artificial islands in the South China Sea. America countered by expanding its naval presence in disputed waters, and by advancing its missile capabilities in South Korea. In the beginning, China confined its response to a few loud statements about America’s “violation” of international law, and by recruiting American allies with the AIIB initiative. Then, Beijing raised the stakes by announcing that it would send nuclear submarines into the area to “deter” US presence. Compounding the dispute was an international arbitration ruling last July, which determined that China has no historic title over the waters of the South China Sea–a ruling, serving to limit China’s drive to control trade and resources in the region. Defiant of the ruling, Beijing flared up tensions, reaffirming its determination to continue the artificial build up, setting “red lines” and sending loud messages to neighborhood countries. Beijing, for instance, warned Japan to “not send Self-Defense Forces to join U.S. operations that test the freedom of navigation in the disputed South China Sea,” according to a Japan Times editorial. Last month, following a show of naval force in the Taiwan Strait, Taiwan sent a blunt message to China by preparing its military forces to fend off Beijing’s threats. Taiwan’s defense minister Feng Shih-kuan told Taiwan Central News Agency that the “enemy’s threats are increasingly expanding” as he issued orders for the military to step up training exercises. Last week, America drew its own red line in the China Sea by asserting its determination to defend Japanese islands claimed by China, drawing Beijing’s angry protests. In the meantime, allegations have surfaced that Japan has launched a propaganda war against China, further flaring tensions between the two countries. That’s something Tokyo has yet to refute. Still, financial markets fixated on central bankers’ easy money and the prospects of a massive US stimulus have been treating the South China Sea disputes as a noise rather than as something more serious. But for how long?